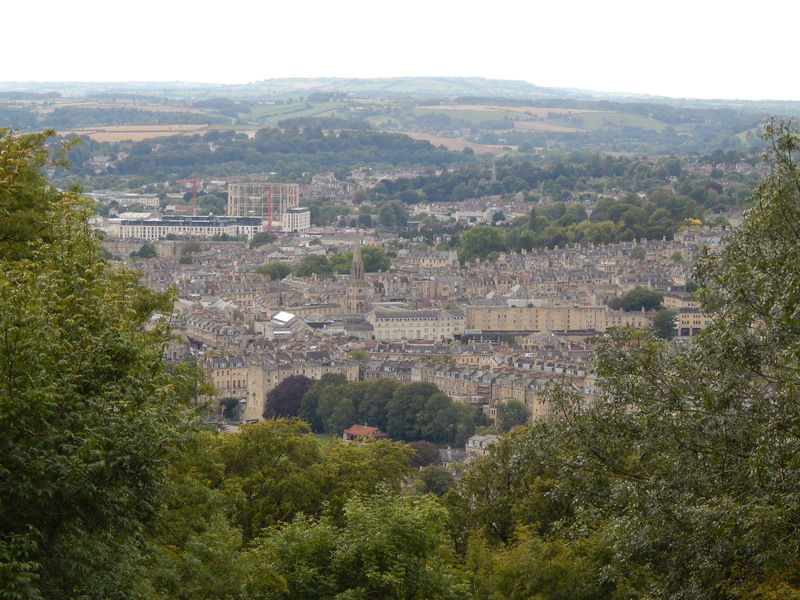 On the weekend, the OH and I walked some of the Bath Skyline Walk. 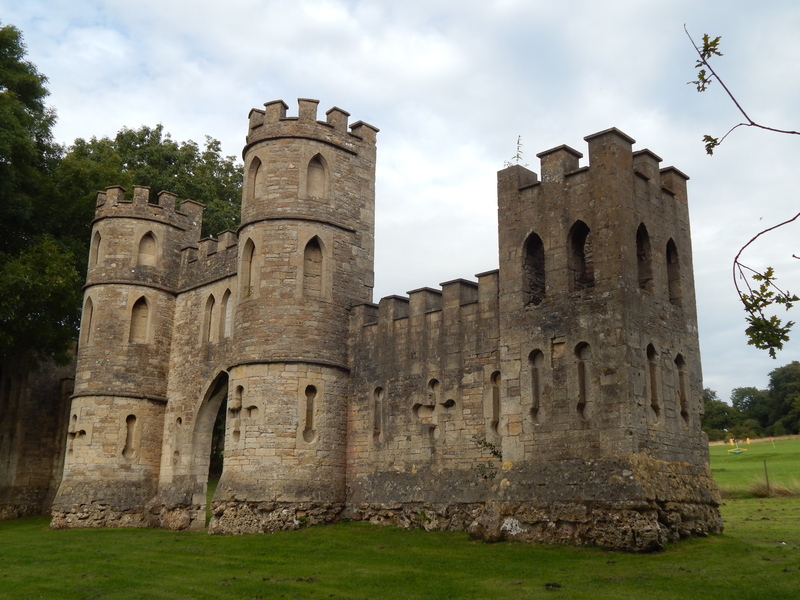 This is a 6 mile walk around the outskirts of Bath, featuring hills, fields, woods, a ‘sham castle’ and views of the city. We only had time/energy for about half of it, but managed to fit in all of the above! Views of Bath and the ‘Sham Castle’ built in the 18th Century by Ralph Allen, to improve the view from his house! 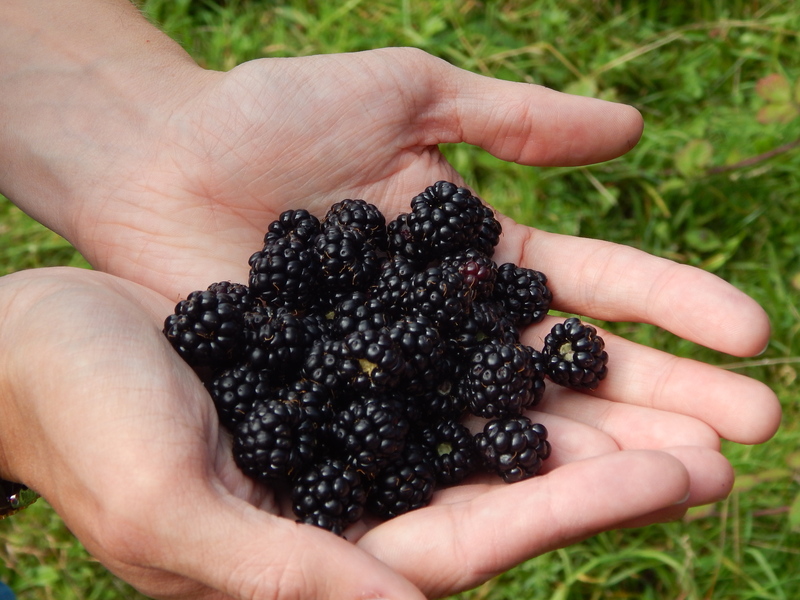 We took a tub with us in the hope of collecting some blackberries, and we weren’t disappointed. Although a lot of the bushes weren’t quite ripe yet, we managed to fill the tub, and eat a couple… In a couple of weeks time I don’t think you’ll be able to move for blackberries on the walk – we may have to go back! 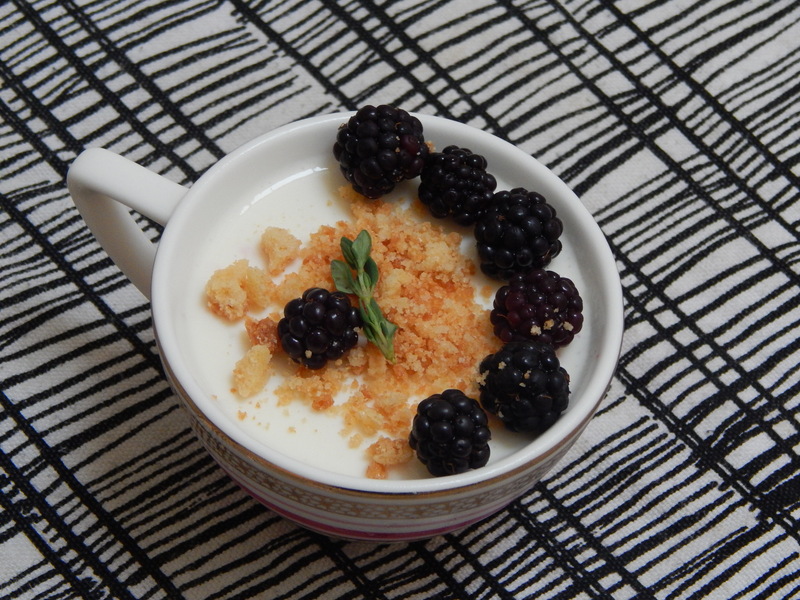 I’d decided to incorporate some blackberries into this week’s bake-off challenge, and because this week we are trying to be healthy-ish (to combat the excesses of the last couple of weeks! ), I tried to find a dessert that wasn’t completely naughty. 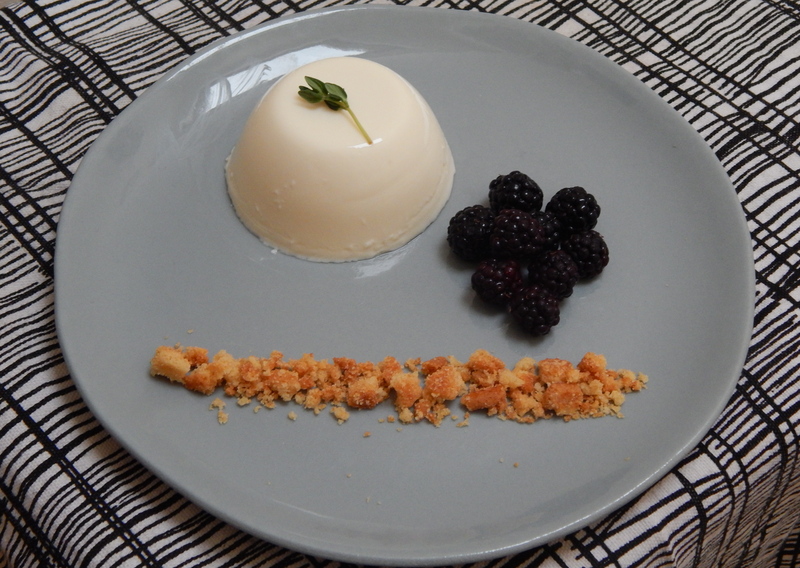 I remember Crème Caramels were made by the bakers one year, and so decided on one of its distant relatives – the Panna Cotta. 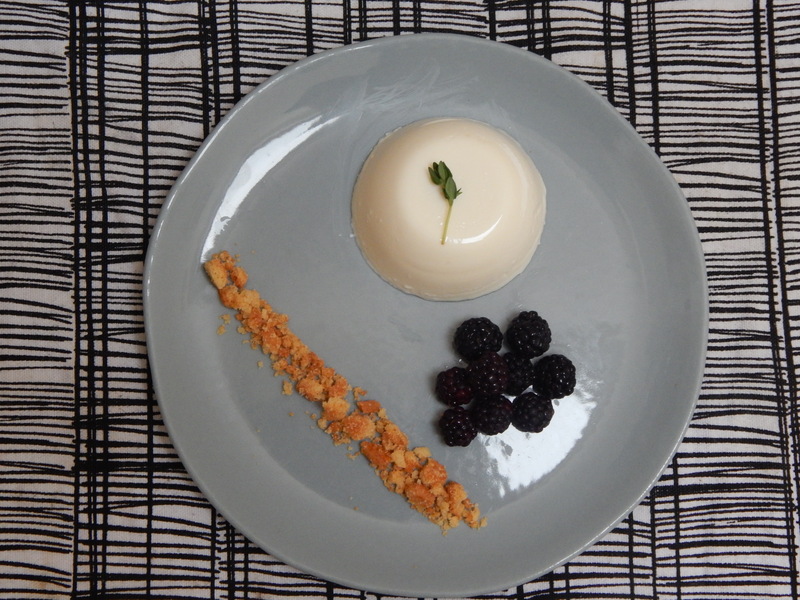 Panna Cotta, the dessert made with mountains of double cream? I hear you. Not what automatically comes to mind when thinking of healthy desserts, but I had a thought it could be made with yoghurt, and a quick search of the internet provided me with a few recipes that seemed to agree with me. 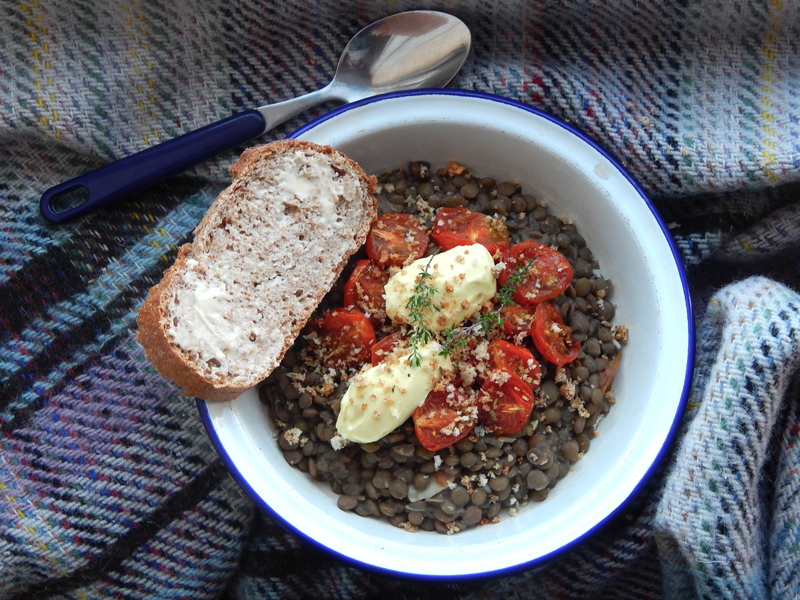 Most seemed to incorporate greek yoghurt with some double cream and milk, so i bought both and had a go…. 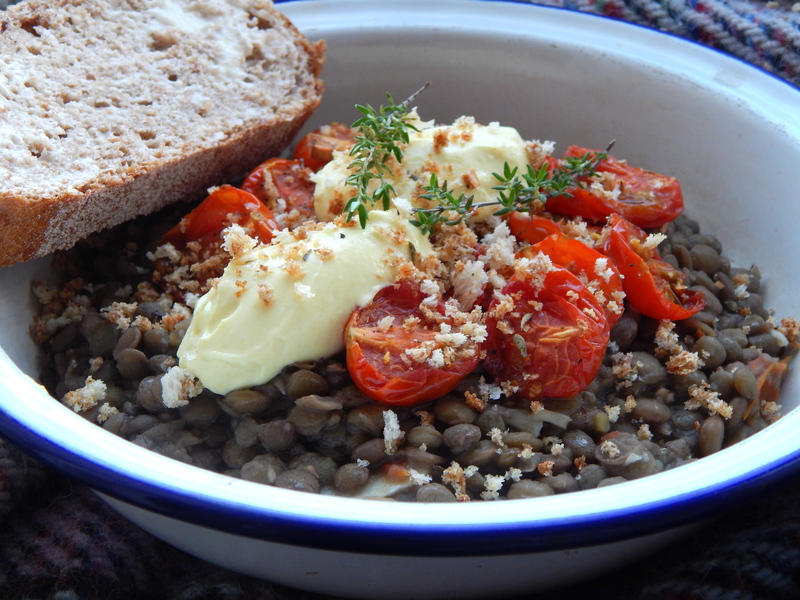 Now, this didn’t end up as healthy as I’d hoped, because I had to make them twice… It all tasted lovely the first time round, but didn’t set properly, so was more like a very creamy yoghurt dessert than a set dessert – see photo below! 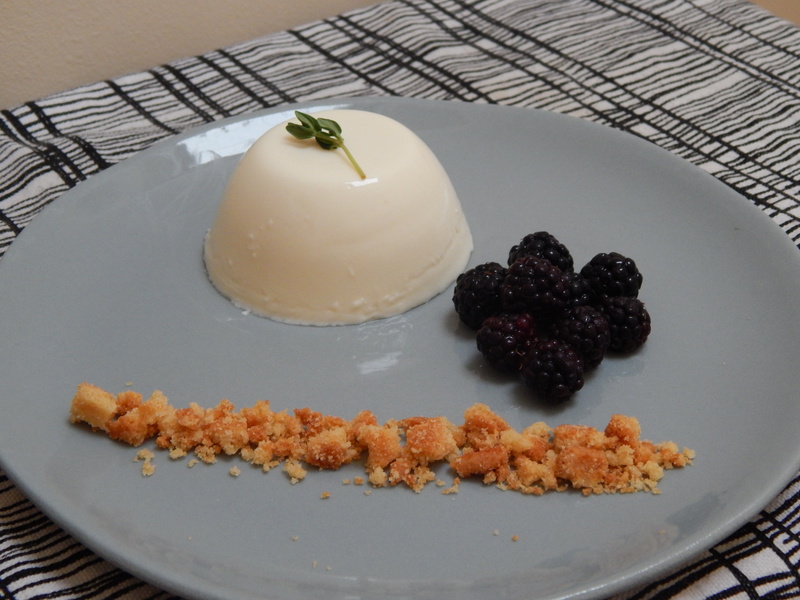 I’d followed one recipe in terms of the gelatine to cream/yoghurt ratio, but looking at other recipes they all seem to have more than mine did. So I tried it again, and upped the gelatine content substantially. 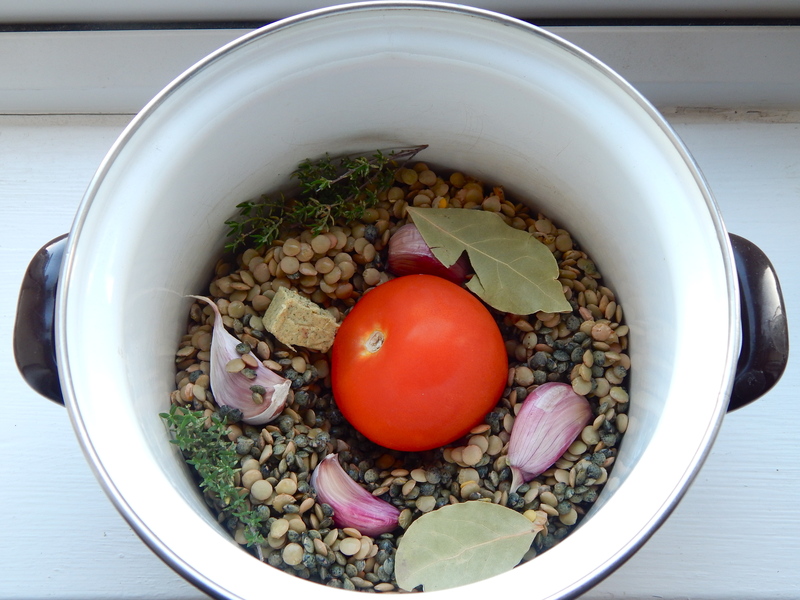 This time things looked more promising! 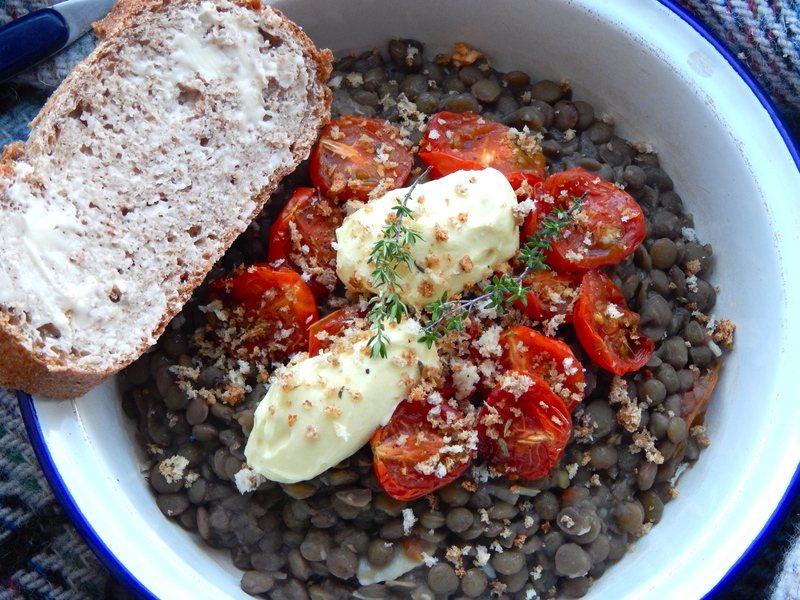 We ate this for breakfast as it didn’t feel as naughty as a traditional Panna Cotta! 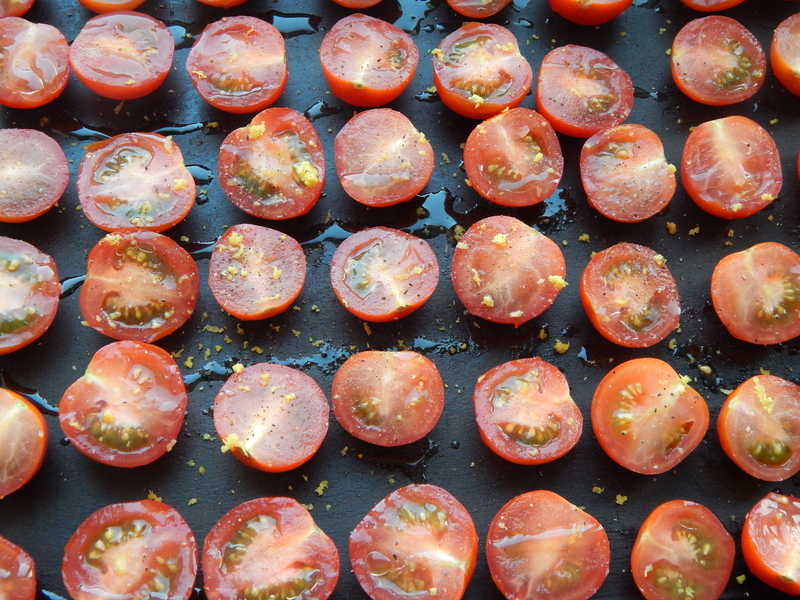 Put the gelatine leaves into a bowl of iced water and leave to soften for five minutes. 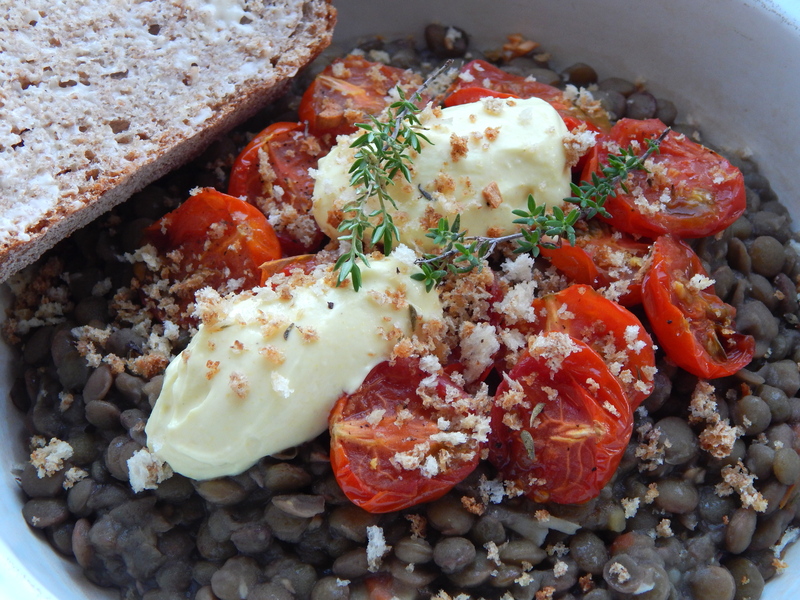 Put the milk, cream, sugar and thyme sprigs into a small pan and bring slowly to the boil. 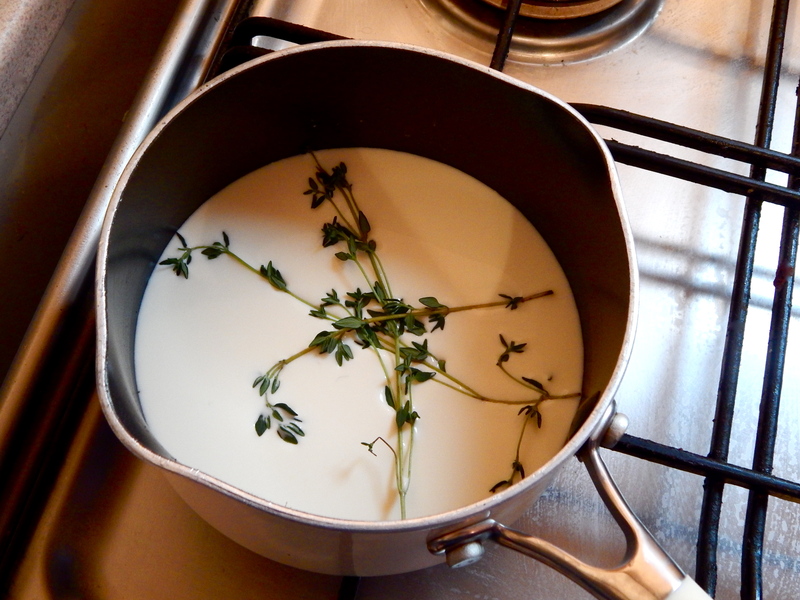 Remove the softened gelatine from the iced water, gently squeeze out the excess water and stir into the milk and cream (discarding the thyme sprigs). Remove from the heat and stir until the gelatine has dissolved. 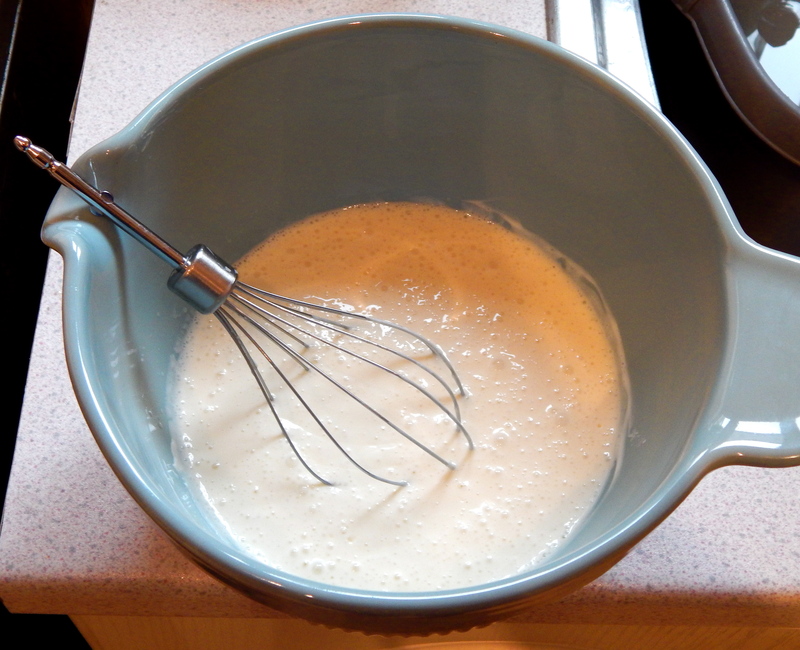 Pour this mixture through a sieve to get rid of any lumps, and pour into the greek yoghurt slowly, whisking as you go. When thoroughly combined, pour the mixture into your moulds (I used tea cups), cover with cling film and place in the fridge for at least 5 hours. 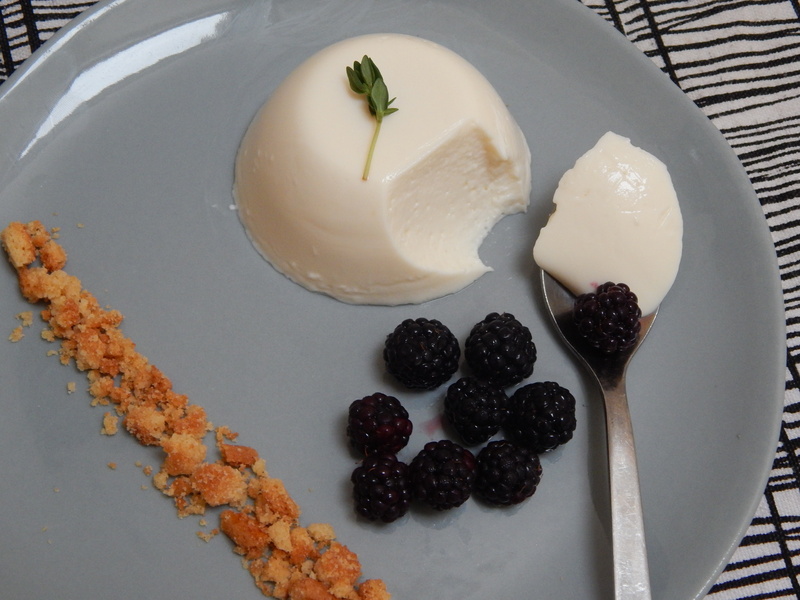 When ready to serve, run a sharp knife around the rim of the mould, and briefly dip the mould into hot water to help loosen the panna cotta. Jiggle it around again, repeat if necessary, and gently pull away from the sides with your fingers or a spoon. It will come out eventually! 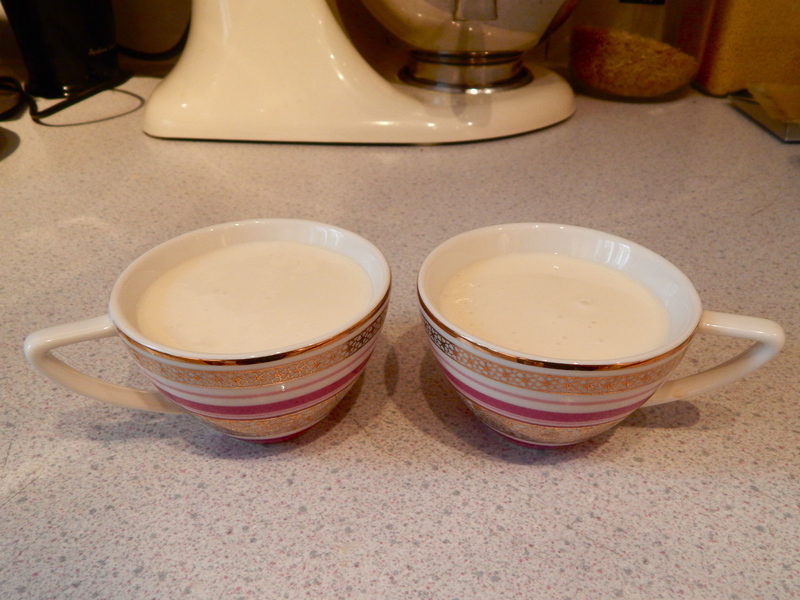 Alternatively, if you can’t or don’t want to get it out you can serve it in the mould/teacup etc – see photo below. It still looks pretty, just slightly less impressive! If turning out, do so onto your serving plate and garnish with blackberries, biscuits, and another small sprig of thyme (if desired). 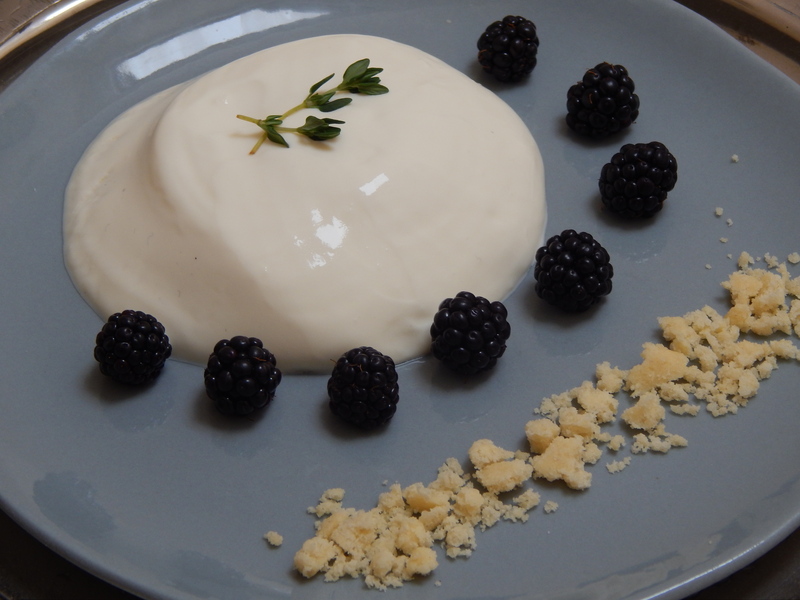 This dessert definitely tasted healthier than a normal Panna Cotta, I think the yoghurt gave it a fresher taste, and the thyme made it slightly more savoury. It still tasted good though, and I will definitely be making it again next time I want a ‘lighter’ treat!